Miguel’s journey to the United States began in El Salvador where he was a gang member. When he refused to help the gang, his mother decided that he needed to leave immediately to escape the violence. She borrowed money from the bank to pay for a guide to help him cross the border and travel to live with his paternal grandmother in California. His first attempt to cross failed, but his second attempt was successful. Just hours after crossing he was apprehended by US officials. He was held with dozens of children, some as young as seven years old. Many of the children he was with crossed alone, like he had done, but others had been separated from their mothers after being apprehended. Officials pressured him to lie and to tell them that he was over 18 so that they could immediately deport him, but he refused. He was eventually released into the custody of his grandmother, with a deportation hearing pending. Despite being released into his grandmother’s custody, Miguel could not escape the violence and was physically abused by his uncle who was also living at the house with his grandmother. After having difficulty finding a lawyer and being ripped off by one, Miguel finally connected with an NGO that agreed to take his case and provide services. Miguel currently resides in a youth shelter in LA while he attempts to get a special child immigrant visa, which would provide a path to citizenship. 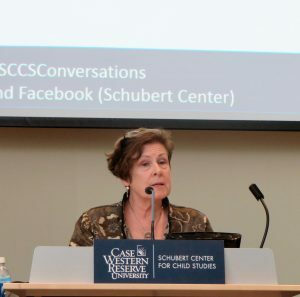 On March 28, the Schubert Center hosted Susan Terrio, PhD for a talk entitled “Whose Country Is This? Undocumented Migrant Children and Youth in the United States after the 2016 Presidential Election.” A Professor of Anthropology and French Studies at Georgetown University, Terrio’s latest book, Whose Child Am I? 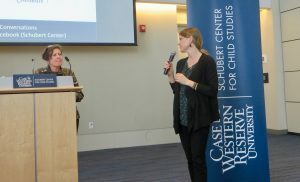 Unaccompanied, Undocumented Children in U.S. Immigration Custody, is based on ethnographic research in shelters for detained migrant youth and in federal immigration courts. Miguel’s story is just one of many that she has documented in her research. Miguel’s story is not uncommon for migrant children from Central America and Mexico who are trying to escape violence in their home countries. Hundreds of thousands of Mexican and Central American children are currently undocumented or living in mixed status families in the US. Undocumented children are increasingly being housed in large facilities or shelters for extended periods of time, and because they are kept in the dark about their status, many self-deport despite being screened for eligible visas. In homes, schools, neighborhoods, and across many other settings illegality affects the long-term well-being of these children. Many migrant children remain poor and have suffered trauma from the journey, being separated from their parents, and the stigma of being undocumented. For many of these children their access to services is hampered by their English skills. In addition to their inability to access services, they also face discrimination by law enforcement, schools, and other institutions. Many of the challenges these children face are daunting. Many migrant children want to go to school and want to succeed, but they are torn between an education and having to repay the fees for their journeys. Migrant children also face the intimidating task of navigating the US legal system. At the end of 2014, the immigration courts had a backlog of over 500,000 cases. In 2014, the rate of legal representation was at 14%, and there were 2,800 deportations for children without representation, most of whom were under the age of 16. Terrio ended her talk by arguing for increased organization and new state and local laws to help improve the immigration experience for these children. When asked, “What do Americans need to understand about your experience?” Miguel answered by sharing his dream of becoming a US citizen and joining the marines. He said that he wants Americans to know that not all immigrants are criminals and everyone deserves a second chance.